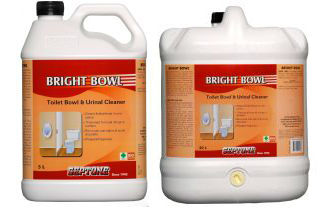 Bright Bowl is a pleasantly fragranced thickened acidic cleaner formulated to clean and disinfect toilet bowls, urinals and rest room floors. 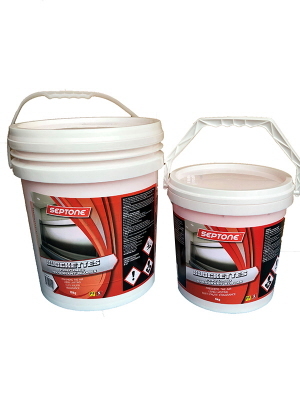 Bright Bowl is suitable for use on all rest room surfaces, including porcelain, stainless steel, ceramic tiles, plastic, glass and concrete, and the product when diluted as recommended is also suitable for use on painted surfaces. 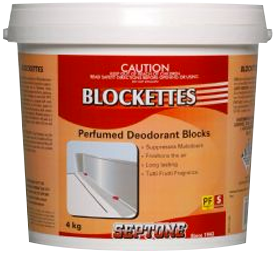 Septone Blockettes, Perfumed Deodorant Blocks are perfumed p-Dichlorobenzene blocks which are used in toilets and urinals to suppress malodours and freshen the air. Blockettes slowly release their perfumed vapours into the air, replacing unpleasant odours. These are more than 99% active p-Dichlorobenzene, as compared with some toilet deodorant blocks on the market, based on actives other than p-Dichlorobenzene, which contain less than 5% active ingredient. Blockettes possess a tutti frutti fragrance. The Blockettes in this pack size are 75 mm in diameter, with a depth of 20 mm and a mass of 100 g. Available in 4kg, 9kg, and 15kg.